The Advanced File Library provides an enhanced document management tool for WebEOC® users and administrators. In addition to supporting the WebEOC File Library features such as storing documents and organizing them into folders, the Advanced File Library takes this functionality one step further by providing the tools to create and organize nested sub-folders. Moving files between folders is simplified by a visual breadcrumb trail displaying the nested sub-folders. Deleting files is easy and a recycle bin provides you with the ability to quickly restore deleted files into any folder or subfolder. Advanced File Library offers flexible permission settings that give administrators full control over the visibility of each folder and file. Group permissions are assigned at each folder level for greater file security. All documents in the library are searchable. You can quickly find the files you need using a keyword or a tag. Advanced File Library provides you with a robust tagging feature that allows you to create tag groups and associate them with folders and files. An import/export option allows you to import or export .csv files to create and manage numerous tag groups. Upload and store files in WebEOC. View uploaded files from any Web browser. Create nested folders for better organization of files. Move files into nested folders. Control access permissions at each level. Delete and restore files into specified folder locations. Create and apply tags to folders and files. Import and export tags using .csv format. 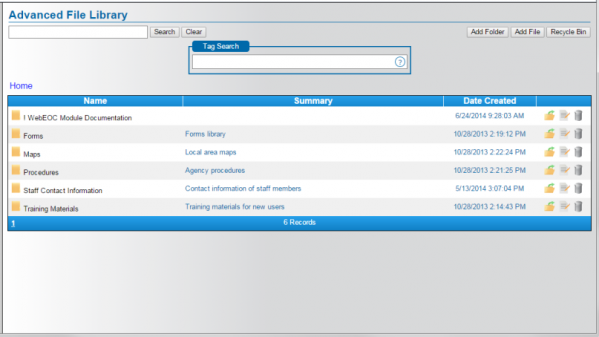 Search for files and folders using keywords or tags.